You are here: Home / Insurance / Why Mediclaim is important and why you Must have a Mediclaim? Why Mediclaim is important and why you Must have a Mediclaim? 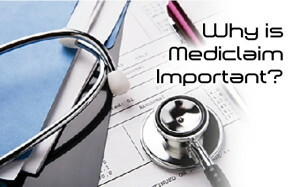 Mediclaim is one of the most important insurance investments that an individual should make in his/her life. If you haven’t or think otherwise, this post will tell you why you must have a mediclaim policy. I often come across people who are only interested in investing or putting money in things that will have returns – monetary returns I mean. Then there are some who feel that certain things happen only after certain age or time in life and hence they postpone things like health cover or mediclaim and life insurance and instead run after products that give returns. My simple question to them is, even if we assume that one may not develop a critical illness based on their family history or age or good lifestyle or whatever (which is actually unpredictable), still what will they do if they had a sudden bout of weakness due to over work and exhaustion and have to be hospitalized? Or What if they have an accident and break a leg or have to be in the hospital for a day or two? Will they always have instant cash available to settle at the hospital? Some may, some may not, and in today’s day and age the expenses of hospitalization do not take time to shoot up each passing day. Hence it is important for you to have a mediclaim policy. Mediclaim policies in India or Health cover provides a facility by which you can either have a cashless treatment done in the hospitals or if the hospitalization is an emergency, you will be reimbursed for the expenses provided you inform the insurer within the stipulated time frame. All those feeling the need ‘NOT’ to have a Mediclaim just because it is ‘NOT’ needed or doesn’t give ‘Monetary Returns’, I request them to please broaden their minds and think clearly for once. Agreed Mediclaim policy does not give you monetary returns, but the cushion they give you in case you do need hospitalization, is worth every penny of the premium paid. Also, if you are young and have started off in life with your career, chances are you won’t be able to afford any steep medical fee, which might arise from a sudden hospitalization. Also if at this point you think that why do I need a mediclaim policy, then this will be your BIG MISTAKE. Even if you are working for a while and earn well, chances are you will have responsibilities like paying bills, meeting daily expenses, saving for the future of your family, planning for retirement, EMI; if you have kids, then their education, marriage etc. Just think of it, will you prefer to pay Rs. 50,000 to 1 Lac in one go and put a dent in your savings or derail your financial planning? Forget preferences, all of a sudden will you have that kind of cash with you always? You may even incur more expenses than that. This is where mediclaim comes in. Mediclaim India policies or Health Insurances will save you from these sudden shocks in life. You MUST understand that, while mediclaim won’t give you any monetary returns, it will prove to be your biggest investment when the need arises, that is in times of medical emergencies. They will cover for your hospitalization expenses, surgery if required, etc. If you can spare about Rs. 6,000 to 7,000 in a year you can get a mediclaim policy in India up to about Rs. 2 Lac. Is this asking too much of your yearly income? Rs. 7,000 a year is about 583 a month or Rs. 19 a day. Rs. 19 a day is not asking too much. So please get yourself a good mediclaim. Some mediclaim policies can also cover you for specific critical illnesses like, diabetes, kidney failure, heart diseases, cancer etc, which will reimburse you even for diagnosis of the disease and also have a medical cover for hospitalization expenses. However this comes at an extra premium and you must take them if you can afford them. If you still think you cannot afford that Rs. 6-7,000 a year, then cut down some of your expenses and get yourself a medical cover today. Even if your monthly salary is Rs. 7,000, assume you did not get one month’s salary and ‘invest’ that money in a good mediclaim policy. Choose a plan as per your age, requirement, dependants etc. Assess how much can you afford in terms of premium and don’t stretch too much by getting a high sum insured, but considering today’s scenario at least get health insurance cover of Rs. 2-3 Lacs for starters and later on take a critical illness cover as well. Health insurance is part of 5 must-have insurance covers in your life. Don’t think, but act now. Save yourself the financial and mental troubles and get yourself a mediclaim today. homes where they have become just a minting machine instead of caring homes. Insurance companies are bound legally to pay your dues wherever applicable and the charges that not covered are clearly mentioned in the policy documents terms and conditions. So it is upto the person buying the policy to go through it and read them carefully and be aware of what is included and what is not. If there is a situation where the inclusive things are not reimbursed by the insurance company then you do have a case where you can claim it in the consumer court. As far as critical illness is concerned, then it is a different matter. Critical illness covers are sold separately or you can have it as an add on to your existing policy. The insurance buyer needs to take the efforts and go through the terms and conditions of the policy. It just takes an hour of your life to do so, but it will ensure that there are no rude surprises when you go for a claim.